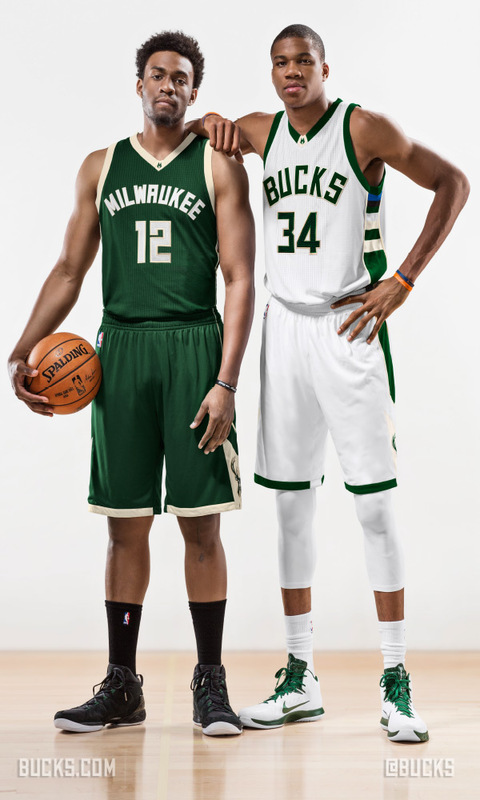 Today the new Milwaukee Bucks jerseys were revealed by Jabari Parker & Giannis Antetokounmpo in MIL and whoo, as I personally expected, very nice! I love the subtle throwback nod with the stripes down the sides, the negative space ‘M’ silhouette continuing from the logo to the bottom of the shorts, the slight “lake blue” addition on both the away and home, and using that “Cream City” cream color throughout the away threads. Plus, if you head over to the Bucks’ site, they have diagrams with explanations of every little detail and historical allusion, including the “Cream City” stripes and a cool ‘Fear the Dear’ player tag that you can barely see below. More close-ups as well for away and home. As I predicted when the logo dropped, I can’t wait for the ‘lake blue’ alternates that are sure to come sometime either next season or the one after that. I’m betting then, and clearly, I’m also greedy because both the away and home jerseys are so, so nice.